The finished measures 49 inches x 61 inches. 49 rows of 39 squares. Each finished square measures 1.25" x 1.25". 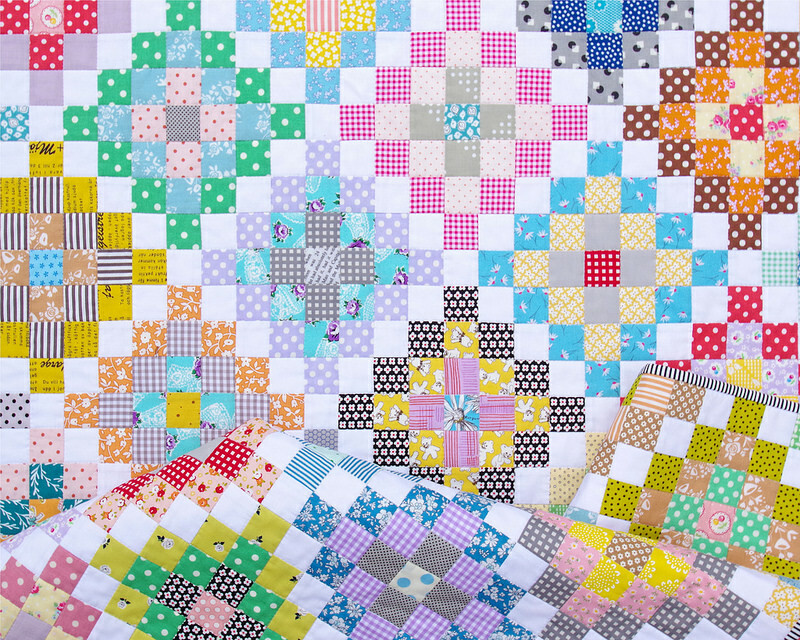 Total number of squares: 1911.
many stash basics - dots, stripes, checks, gingham. lines - spaced 1.25 inches apart. 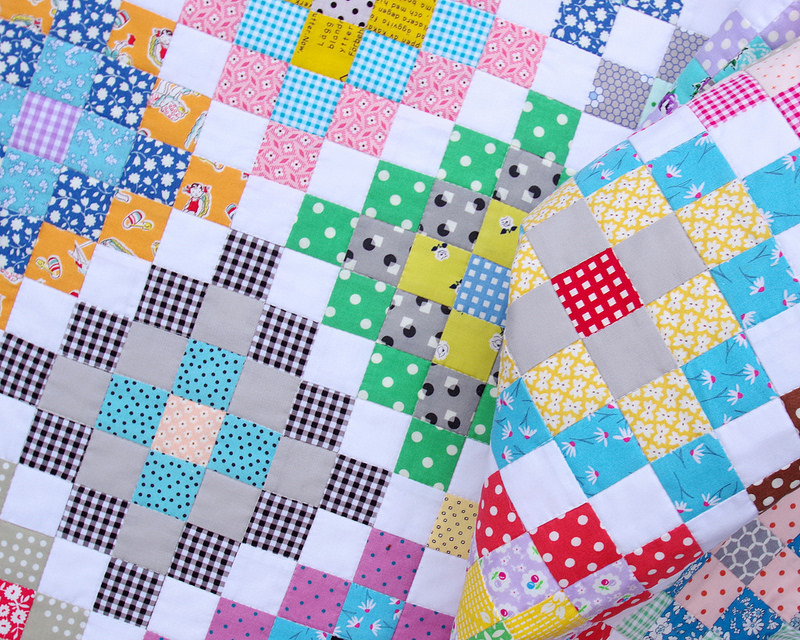 A new week and a finished quilt, and as always I have lots of photos to share with you today. 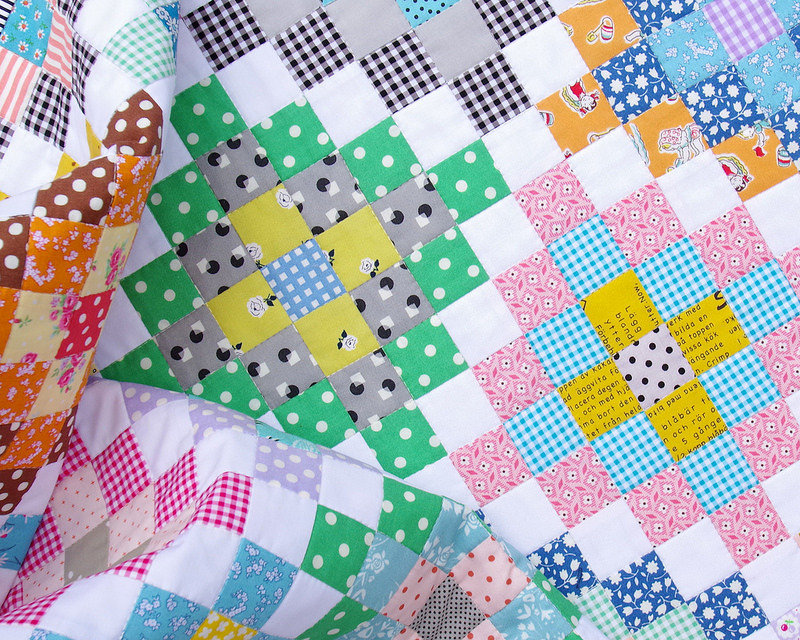 This quilt was inspired by the many Trips Around the World Quilts that have gone before it! 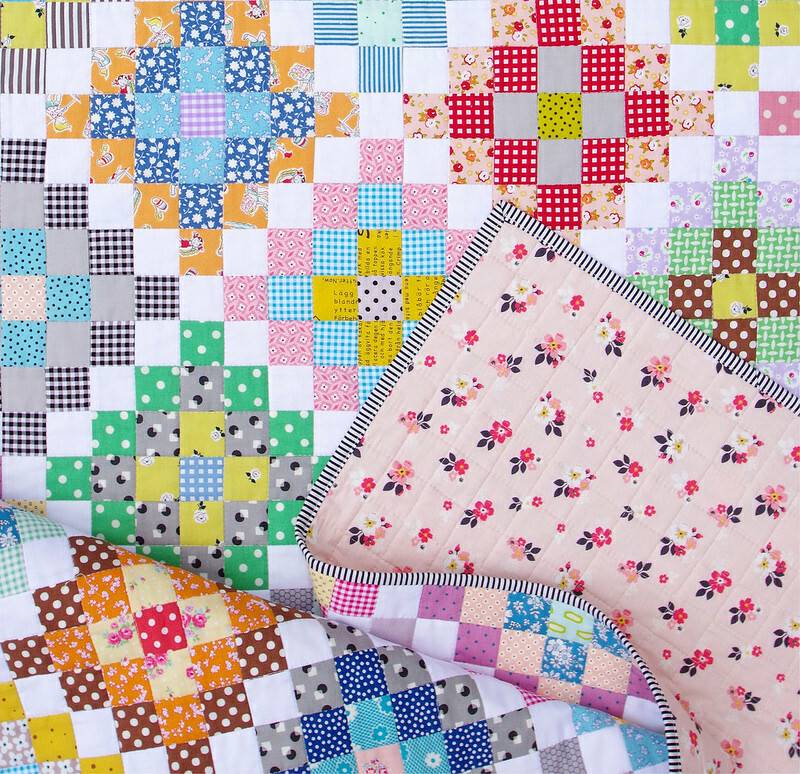 It must have been - and still is - a popular traditional quilt design both with hand and machine piecers. 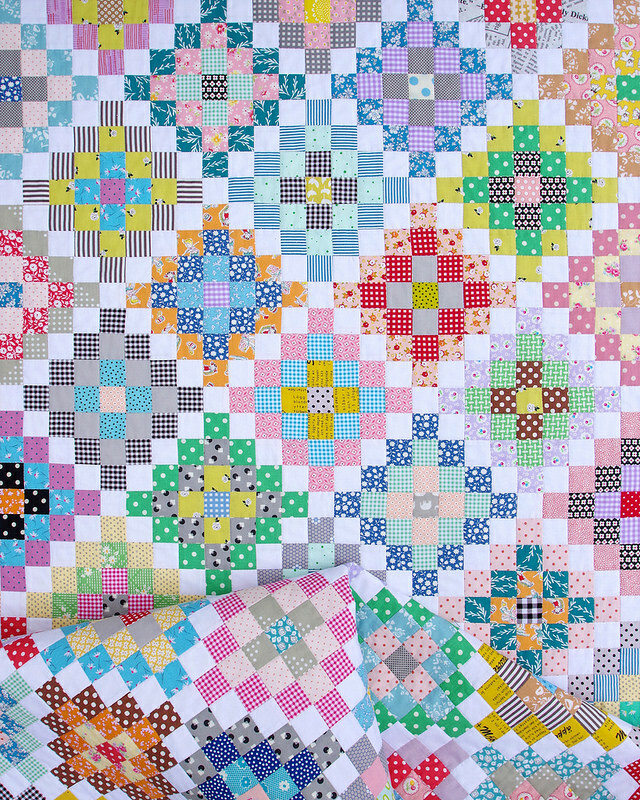 I machine pieced the quilt top and re-worked my Scrappy Day Trip Quilt Pattern - which is a block based design with strip pieced sections - and I adjusted it for the extra trip - or additional round of squares - around the center square. 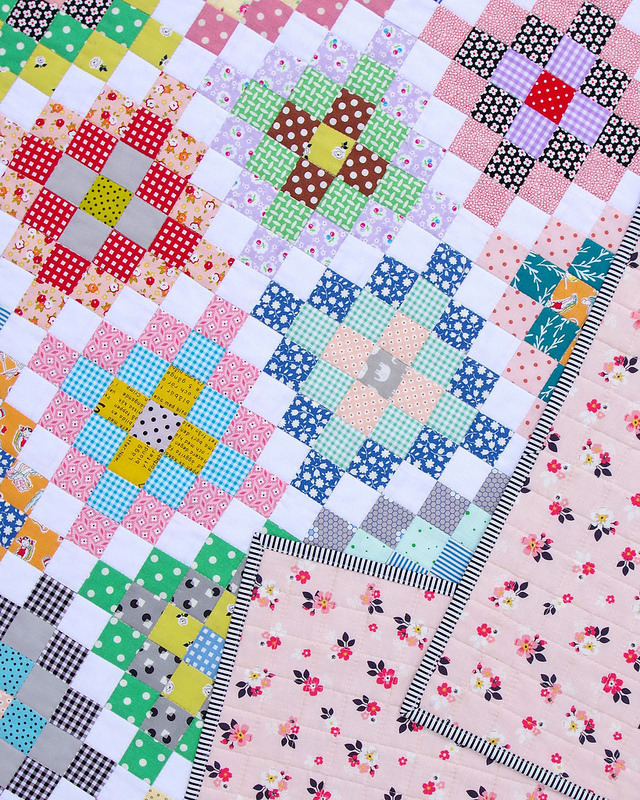 This allowed me to work on one block at a time; cutting fabric, strip piecing and sewing together each block as far as was possible, and then machine pieced the quilt top without it being too much of a puzzle. 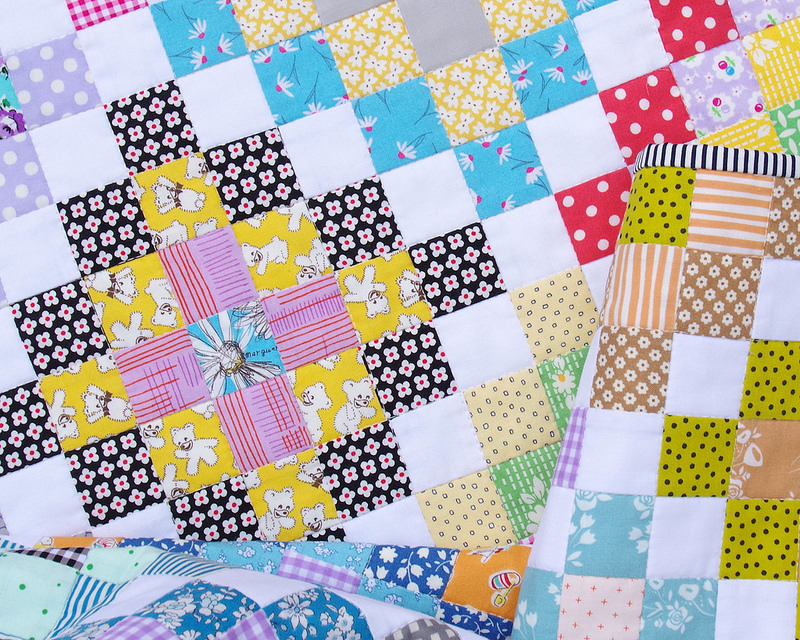 I finished the quilt by ditch stitching all seam lines, creating an all over grid of intersecting lines just 1.25" apart, and a texture that is lovely to touch and at the same time allows the quilt to drape softly. 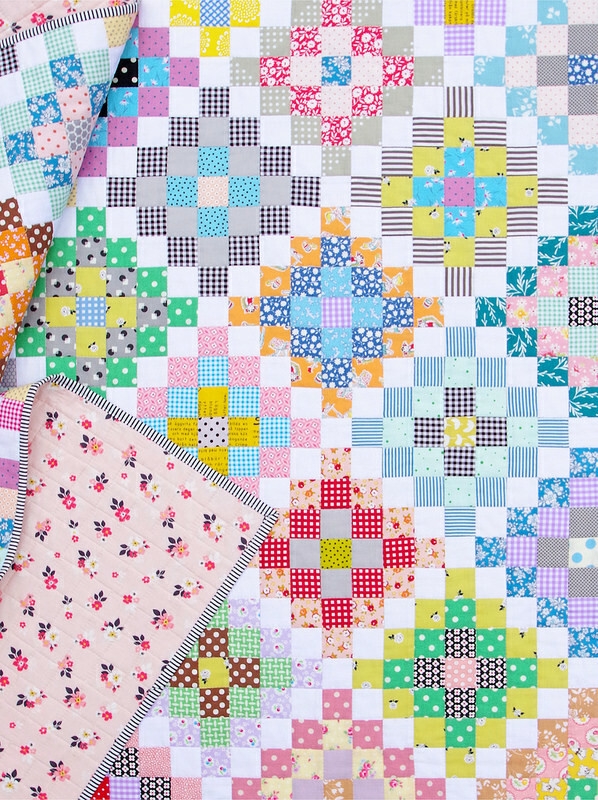 That is a lot of quilting lines! For the back of the quilt I have used a single floral fabric with a soft pink background from the Vintage Daydream collection by Design by Dani for Riley Blake Designs. For the quilt binding I have used a black and white stripe fabric for my signature quilt finish. 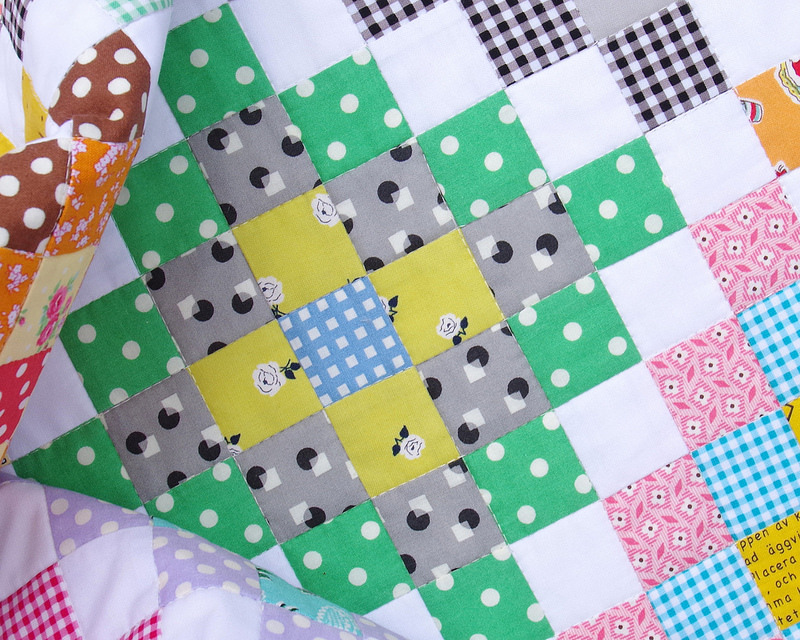 A simple black/white stripe binding works so well with a scrappy quilt. Thank you so much for stopping by and for scrolling through the many photos! COPYRIGHT: Do not copy or use any content (this specifically includes all photos) from my blog without my written permission. This is original content from www.redpepperquilts.com. sweet! the backing makes it absolutely delicious! Are the instructions for adding the “extra trip” in your pattern in you shop? Do you explain in your PDF pattern how to sew this together without having to sew it in long diagonal strips? You made reference to adjusting the pattern so that you were able to work on one block at a time. I have looked closely at your white squares to see if they were made of triangles but I'm not seeing that. How did you do it? Thanking you in advance. 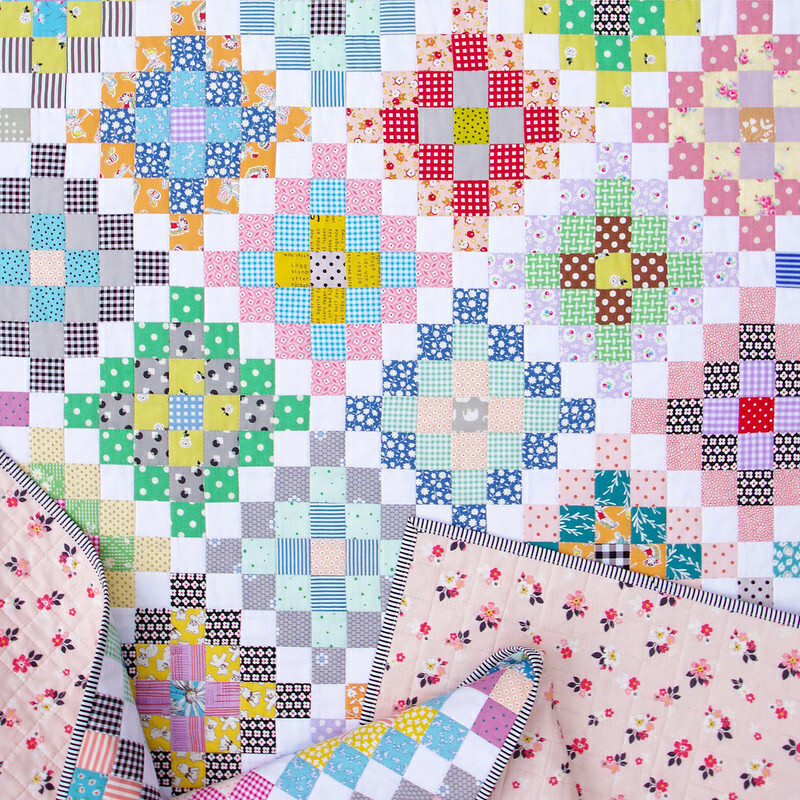 I do just love this quilt and would love to make it also. 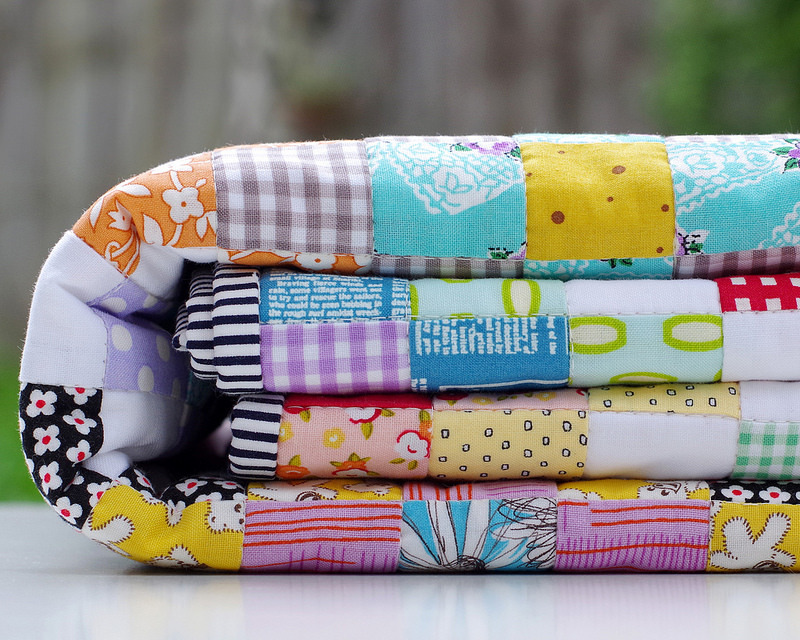 Hi Maxine - the Scrappy Day Trip Quilt Pattern is not sewn in long diagonal rows. 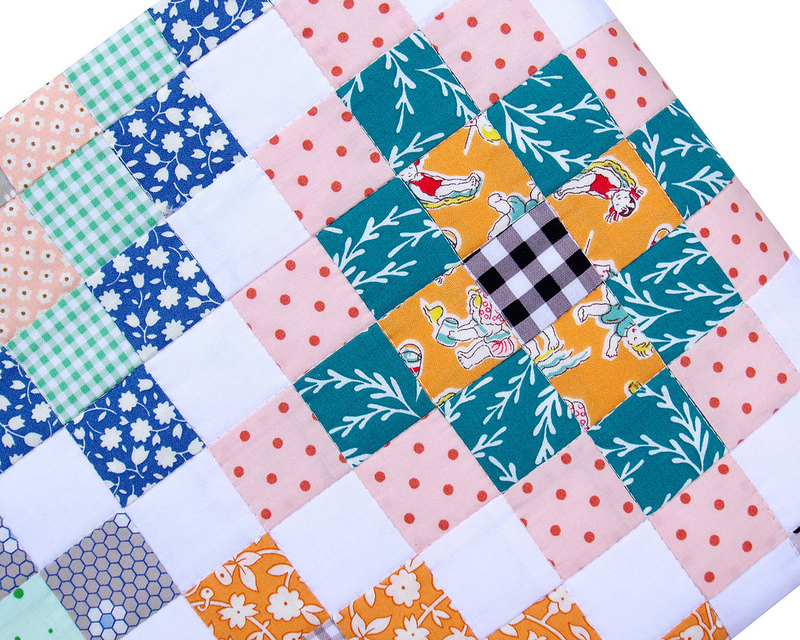 Instead it is a block based design with partial construction of each block - some of which is strip pieced. 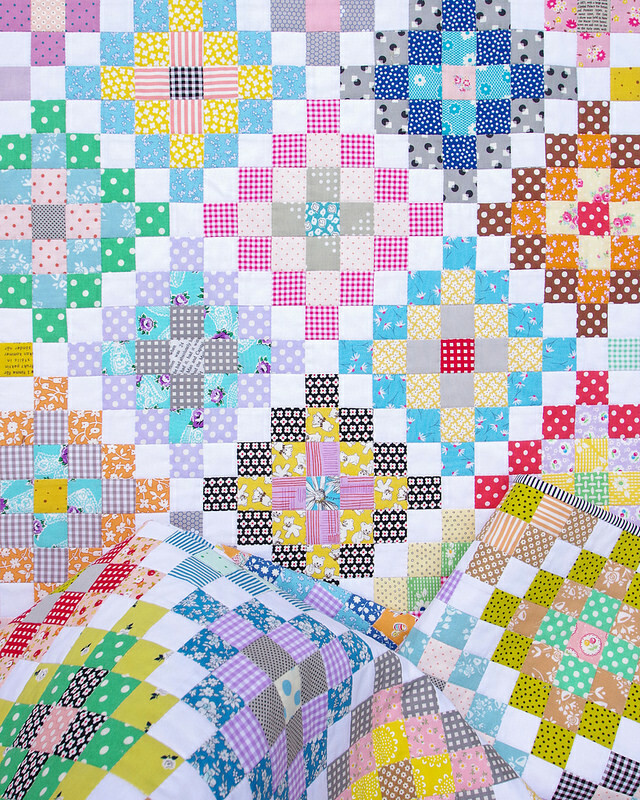 All patchwork pieces are squares (no triangles). Wow! 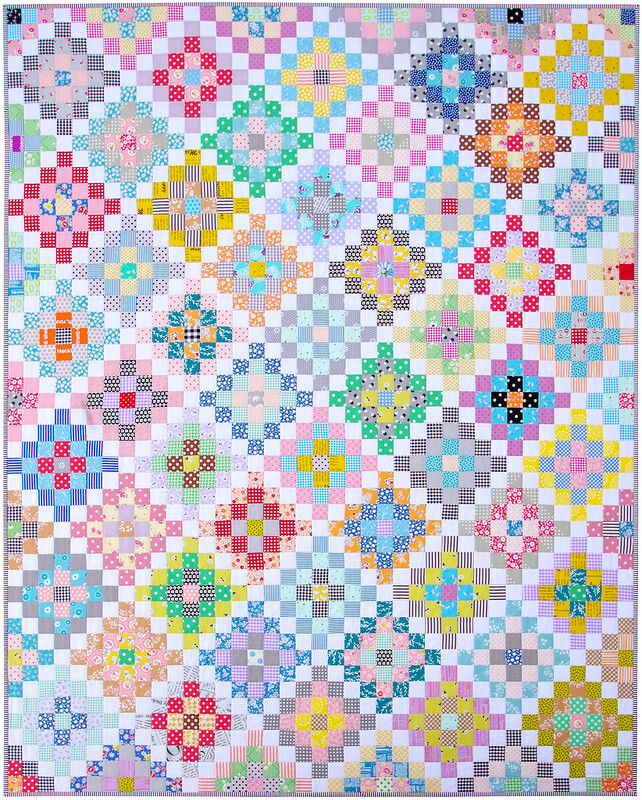 This is one of your most beautiful quilts!! Well done. Those little pops of black are just the right touch. What a beautiful quilt............thanks for sharing ! Thanks Rita for explaining. I'll buy your Scrappy Day Trip Pattern. I think I'm imagining how to do it, but I'll purchase the pattern, just so I know for sure. You have a wonderful sense of color. Thanks for sharing.